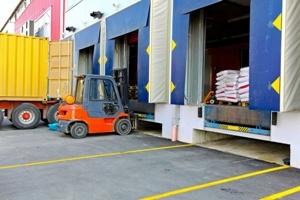 Loading docks are used at many warehouses, factories, industrial buildings, and retail businesses to deliver and pick up goods and equipment throughout the Augusta area. This can be time-saving for businesses and the workers who must unload and load delivery trucks. However, the docks can become very congested, and workplace accidents are common. Workers can suffer serious injuries that require them to be off work for months or longer while they recover. Fortunately, they may be entitled to workers’ compensation benefits to pay their medical bills and to replace lost wages under Georgia law. One of the most frequent mishaps on a loading dock is a slip and fall accident. Floors can become dangerously slippery when oil, water, other liquids, or debris are not cleaned up. Workers can fall off the edge of the dock if the dock door is left open or there are no barricades installed at the dock entrance. In addition, they can suffer catastrophic injuries if they fall from heights on a ladder or from a forklift or other industrial equipment. When loads are not properly stacked or secured, the load can shift and fall onto workers when they begin emptying the truck. If the cargo is heavy, a victim can be crushed and suffer catastrophic injuries and death. Unfortunately, some forklift accidents occur when the operator does not see nearby co-workers and strikes them. Other catastrophic injuries can result if the forklift tips over or falls off the dock. Some accidents happen when the truck is backing up into the docking area and the trucker does not check his blind spots or simply fails to see those nearby. The injuries can be fatal if employees are crushed between the truck and a nearby wall, dock, or other equipment. Depending on the type of business and the materials being unloaded, workers can be exposed to hazardous chemicals and other dangerous substances. This can cause them to suffer occupational illnesses, such as respiratory diseases or cancer—sometimes life-threatening. Individuals in loading docks often work in awkward positions, carry heavy loads, and perform repetitive movements. This can cause them to suffer injuries to their backs, shoulders, neck, knees, and spine that can cause chronic pain and limitations in movement that prevent them from working. If you've been injured on the job you need to speak with an experienced workers' compensation lawyer as soon as possible. Contact us online or call our Augusta office directly at 706.863.6600 to schedule your free consultation. Local Augusta lawyer specializing in workers' compensation, car accident and personal injury claims. Posted on 12/22/2017 Are You Entitled to Workers’ Compensation for Injuries Caused in a Car Accident? Posted on 11/23/2017 What Should You Consider When Deciding Whether to Accept a Settlement of Your Workers’ Comp Case? ?Are my workers’ compensation benefits taxable in Georgia? ?What should I tell my workers’ compensation doctor following my workplace accident? ?What happens if I was injured at work and my employer does not have workers’ compensation insurance?